Over the past 40 years, Russkell Furniture has grown and developed into a highly-regarded manufacturer of quality products from chairs and sofas to an eclectic range of unique homeware. As our growth continues, we are now able to extend our service to encompass the globe, quickly and securely delivering bespoke furniture direct and providing a piece of true British craftsmanship. The expert skills of our specially-selected upholsterers have been honed by many years of experience and each piece of lovingly-crafted furniture is guaranteed to exceed expectations and provide an extensive service life. If you are looking to bring a touch of high-class British elegance to a room, then the quintessentially-English Chesterfield sofa is the ideal choice. 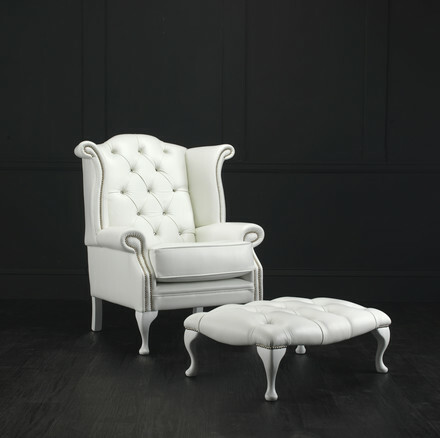 The design traces its history back to the early 18th century when the Earl of Chesterfield, a rather dandy man with a reputation as a trendsetter, asked a furniture maker to design for him a chair that could “allow a gentleman to sit upright, in the utmost of comfort, without wrinkling (his) garments”. Thus the Chesterfield sofa was created with its signature deep-button upholstery, equal arm and back height, rolled arms and luxurious nail-head trim. 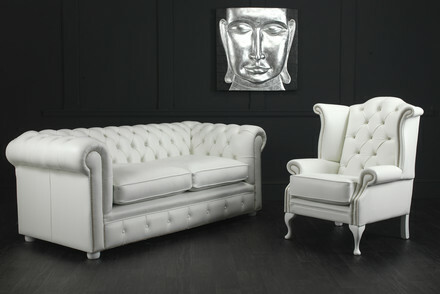 The Russkell Furniture take on the Chesterfield sofa design, Chatsworth, is at once contemporary and timeless. Created by our appointed team of specialist Chesterfield experts, Chatsworth furniture features polished bun feet and heavily-studded scrolled arms which command attention and, available as an armchair or 2- or 3-seat sofa, the design is completely versatile in order to fit into any space. As with our entire range of luxury made-to-order furniture, a multitude of fabrics and leathers can be chosen from for the upholstery, each with their own further options of colour and pattern. Antiques are popular around the world and Britain has some of the best examples. This love for the vintage continues to influence interior design and there are several fantastic pieces designed to create the popular aesthetic available from our dedicated homeware section. Currently extremely popular is our collection of tin plaques which, creatively placed, will add an instant retro feel to any room. A particular favourite is our 'Pear's Soap' plaque which features a reproduction of a vintage advertisement for the brand; this product would make a unique gift and is especially suited for use in the bathroom. Don't forget that it is currently the Russkell Furniture Spring Sale and all orders will receive a fantastic 10% price discount at our fast, secure and reliable online checkout. For more information on delivery times and charges for worldwide shipping, please contact our team by calling 01254 773232 or email us at info@russkellfurniture.co.uk. Russkell Furniture - transforming homes around the world.